Should the Green New Deal Repeat the Failures of Cap-and-Trade? We are always acting in light of our failures, either trying to evolve past them or break through them. The current push to address climate change is taking place in response of one of the biggest political failures of the past decade, the failure to pass cap-and-trade during President Obama’s first two years in office. 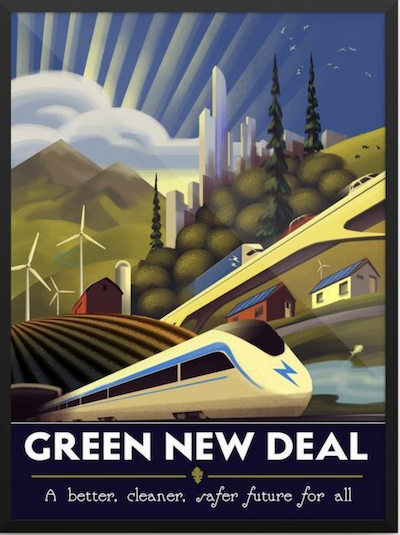 The intense debate that has broken out over the Green New Deal between activists and the center, who all believe climate change is real and needs a response, is largely about this: can we simply repeat the strategy that cap-and-trade tried, or do we need something new? (When I say “cap-and-trade” I don’t mean the policy, which may or may not be a good thing for a Green New Deal to incorporate. As I will elaborate, I mean the way activists tried to pass cap-and-trade in 2009 to 2010.) You can’t “yes, and” the strategy used by cap-and-trade and the strategy envisioned by the Green New Deal, and resources, energy, time and money need to be allocated with some strategy in mind. There’s been a wave of attacks against the Green New Deal not just by conservatives, but by people in the center supportive of climate action that is actually about this question. The ugliness of it is a function of the fight over who will get to determine what the strategy looks like. This question is opaque enough to be confusing to general readers. Is there really this much intensity about whether increased soil health should be on a climate agenda resolution? As Dave Roberts notes at Vox, virtually all the policy criticism of the Green New Deal by the center (it should highlight a carbon tax! It needs nuclear energy!) are things that can easily be incorporated within a Green New Deal, and part of the Green New Deal is creating a mechanism for debating this. These attacks tend to duck the actual question we face. So I’m happy to read An Open Letter to Green New Dealers, by Jerry Taylor, the president of the Niskanen Center, which starts to put these cards on the table. Taylor’s piece is long. Woven through it is an argument for a political strategy that mirrors the one cap-and-trade used. For myself and many others like me, Taylor’s political case is so self-evidently wrong it isn’t worth trying, though I think it is worth discussing. First we need to know how we got here. We call it Obamacare, but we could also call it Post-Hillarycare. The most important thing to know about the strategy for passing the Affordable Care Act is that the people who designed it and carried it out did so in light of the failure of President Clinton’s push to pass universal healthcare in the early 1990s. They were either directly involved or studied it. Everything odd about trying to enact the ACA makes sense viewed this way. President Obama leaving it to Congress to debate too long, the revenue-neutral battles with CBO and the mandate structure avoiding the idea it was a tax increase, getting industry on board and making pledges about keeping your health care: all of these make sense as people reacting to conventional theories about why President Clinton’s health care push failed. I always understood that. But as Theda Skocpol found in her excellent 2013 review of how cap-and-trade failed, Naming the Problem, cap-and-trade strategists learned a different lesson from their most proximate experience, the acid rain amendments to the Clean Air Act of 1990. These amendments successfully created a cap-and-trade system that solved the problem. They learned that small, targeted, technical, market-based solutions to environmental problems can bring enough support from both business and moderate Republicans to be successful. Don’t make it big, and don’t call too much attention to it. The experience during the 2000s no doubt encouraged it, with Senator John McCain pushing for a price on carbon alongside Joe Lieberman. This strategy failed. McCain and every other moderate Republican bailed, and climate change action was mobilized against by every part of the movement conservative apparatus. Say what you will about the shortcomings of the Affordable Care Act or Dodd-Frank (trust me, I’ve heard it on the latter), but they passed. Cap-and-trade did not. There’s a weird dance around calling this a failure, as if clean energy investments in the American Recovery and Reinvestment Act make up for this failure, but it was a failure. The movement was in a deep funk for the subsequent 8 years until some young people started occupying spaces demanding a Green New Deal, and now it is all anyone can talk about. I can understand why people in 2006 thought their cap-and-trade strategy could work, though it didn’t. I don’t understand why they think that in 2019. It is pretty funny Taylor makes you read 10,000 words before getting to the argument that clearly animated it from the beginning, that “one can imagine Republicans embracing some degree of meaningful climate action.” But there’s a clear theory of change here, one that sounds exactly like that from the 2009 cap-and-trade push. Reformers of all sorts who want to change energy production and use in the United States will have to publicly dramatize the challenges and offer understandable solutions that do not appear inimical to the everyday values and economic concerns of ordinary American families struggling in an era of stagnating incomes and contracting opportunities. Climate change warriors will have to look beyond elite maneuvers and find ways to address the values and interests of tens of millions of U.S. citizens. To counter fierce political opposition, reformers will have to build organizational networks across the country, and they will need to orchestrate sustained political efforts that stretch far beyond friendly Congressional offices, comfy board rooms, and posh retreats. Compromises with amenable business interests will still be necessary. But insider politics cannot carry the day on its own, apart from a broader movement pressing politicians for change. In almost every sense, the Green New Deal is a reaction to the failed strategy of cap-and-trade. Rather than try and hide what is happening through opaque structures and diffuse mechanisms, it takes it straight on as part of a broader vision of economic transformation. Instead of an insider strategy of peeling off the most moderate members of the Republican Party through a focus on their immediate influencers, it instead ties itself to an outside strategy of a broader social movement. Instead of viewing fighting climate change as a cost nobody wants to own, the Green New Deal instead looks at it as an opportunity to change our economy. Next Time Will Be Different! I have no idea if a Green New Deal strategy will work. But it is so self-evident to me that a second go at the cap-and-trade strategy would fail, a true second-time-as-farce utter failure, that it is hard for me to understand where its advocates like Taylor are coming from. But not everyone agrees. There’s a lot of debate about Obama’s legacy and the 2009–2010 period, and maybe now that things are different the outcome will be different. So let’s try to think about what could be different about trying this strategy going forward out here in 2019. As extreme climate events become more common and the threat of global warming becomes more obvious, perhaps conservatives will move to take climate seriously. But I see no evidence that this is happening. Where would it even come from? Among the four key components of the conservative infrastructure, the donors, intellectuals, base and media, none of them have budged on the issue of climate in the past decade. The money that is even nominally about climate on the conservative side doesn’t bother to prioritize it; see Rebecca Leber’s reporting on Jay Faison. We should also understand that if and when conservatives take global warming seriously there’s no reason to assume they move to technocratic, market-based solutions, instead of nationalism and fascism. Eric Levitz has a great piece on this; there’s every reason to believe that as conservatives start to engage climate change they’ll want bigger walls, more military, and go even further into viewing international affairs as fundamentally zero-sum; this is, politely, not a worldview conducive to putting a social cost put on carbon. For people who aren’t conservatives, blaming President Obama for failures in 2009–2010 tends to be associated with the further Left. But there are a lot of polished people high up in the environmental space who speak privately of Obama in ways that make dirtbag podcasters sound like Jonathan Chait. “If only President Obama….” is common in the cap-and-trade space, often with the criticism that Obama could only do one big thing, and chose to do health care instead, leaving climate in the lurch. Similarly, people blame the context of 2009 and 2010. 10 percent unemployment, bank bailouts, millions of foreclosures, the deepest recessions since the Great Depression. How can you ask people to be willing to pay more to prevent climate catastrophe decades out when they’ve lost their jobs and homes? Maybe next time will be different. I’m sure these were relevant for 2009, but I have no idea how they will make next time different. How will “generic moderate Democrat TK” do better than Obama? President TK is still going to face the same challenges but even more mobilization against him or herself. There’s no evidence that a better economy is moderating opposition to climate action, certainly conservative infrastructure was fighting any price of carbon from being in budget negotiations throughout the mid-2010s, and it is possible that we’ll be in another recession when the next opportunity happens anyway. Maybe a new go of using a cap-and-trade strategy will do a better job of hiding the ball? The Tea Party was a very 2009 specific movement, and maybe it will be harder to mobilize against climate action if we do an even quieter job of hiding it. I don’t see how this is possible. The conservative media infrastructure will amplify anything, and money will move to mobilize against it no matter what. It’s really important to understand this wasn’t just the Tea Party and Rush Limbaugh, but the conservative think tank infrastructure as well. These are people who will absolutely find anything that implicitly tackles climate change and polarize it as if it was the full Green New Deal. Even if we come up with the “Nothing to See Here, Definitely not a Price on Carbon” Act and get moderate Republicans to play along, the conservative movement will find it and mobilize against it. It would have been nice if a strategy based around influencing moderates to diffuse attention from what needs to be done worked a decade ago. But it did not. We are stuck here with figuring out where to go next, and that will involve a broader movement that incorporates more people with a better vision of what is possible. To do the same old failed thing again is the definition of insanity. Always dressed and buttoned up.